Last night I reluctantly finished reading Kisses from Katie. A book that has single handedly changed my entire perspective on life. I did not want to finish reading because I wanted it to continue. I have never before been more thankful for blogs! What would cause an eighteen-year-old old senior class president and homecoming queen from Nashville, Tennessee, to disappoint her parents by forgoing college, break her little brother’s heart, lose all but a handful of her friends (because the rest of them think she has gone off the deep end), and break up with the love of her life, all so she could move to Uganda, where she knew only one person but didn’t know any of the language? A passion to make a difference. Katie Davis left over Christmas break her senior year for a short mission trip to Uganda and her life was turned completely inside out. She found herself so moved by the people and children of Uganda that she knew her calling was to return and care for them. She has given up a relatively comfortable life—at a young age—to care for the less fortunate of this world. She was so moved by the need she witnessed, she’s centered her life around meeting that need. Katie, a charismatic and articulate young woman, is in the process of adopting thirteen children in Uganda, and she completely trusts God for daily provision for her and her family.Despite the rough conditions in which Katie lives, she has found a life of service to God to be one of great joy. Katie’s children bring constant delight and help her help others by welcoming whoever comes to their door. As the challenges grow, so does Katie’s faith and her certainty that what she’s doing in Uganda, one person at a time, will have far-reaching rewards. It isn’t the life she planned, but it is the life she loves. 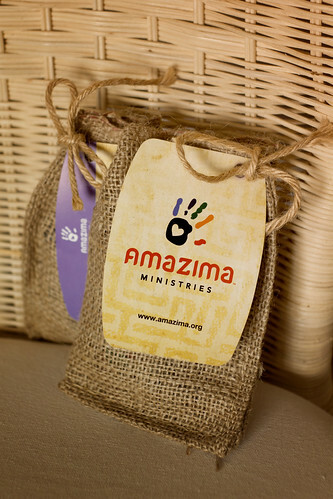 To further her reach into the needs of Ugandans, Katie established Amazima Ministries. The ministry matches orphaned children with sponors worldwide. Each sponsor’s $300/year provides schooling, school supplies, three hot meals a day, minor medical care, and spiritual encouragement. Katie expected to have forty children in the program; she had signed up 150 by January 2008; today it sponsors over 400. Another aspect of the ministry is a feeding program created for the displaced Karamojong people—Uganda’s poorest citizens. The program feeds lunch to over 1,200 children Monday-Friday and sends them home with a plate of food; it also offers basic medical care, Bible study, and general health training. 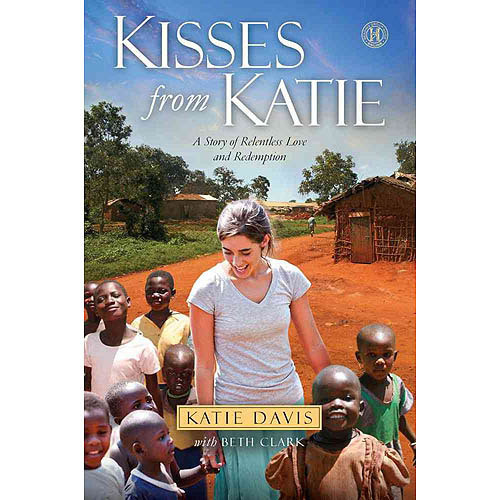 Katie Davis is more than fascinating, she’s inspiring, as she has wholeheartedly answered the call to serve. Before I had even finished reading the book I asked my dear husband for one thing for Christmas. 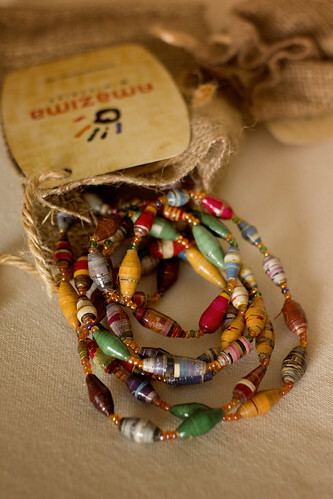 Necklaces made by the women in the impoverished city of Masese that are sold so they can provide for themselves and their families. When they arrived in the mail I squealed in delight. Yes. Squealed! And today I’d like to bless two people! One will receive the book Kisses from Katie and the other will receive a necklace from the wonderful women of Amazima! All you need to do is comment in the rarely opened comment section and tell what you are thankful for. You can enter a second comment for sharing on Facebook and a third comment for sharing on Twitter. But the catch is that you have to mention in the comment section below where you shared it AND add something else you are thankful for. So you can enter up to three times. You have until Thursday night and on Friday we’ll draw two winners. I look forward to hearing your eucharisteos! I am so very, very thankful for incredible friends who love God with the same passion and fire that I do. Who can sit with me for hours and talk about what it means to be a true Christian… and then GO out and LIVE it. This book is a wonderful, wonderful book that I enjoyed immensely. No need to enter me in the drawing for it. (I ordered it before it even came out. *smiles*) But I thought I’d offer a bit of thanks anyway! I’m thankful for the hope we have in Christ, that notated how hard life as we know it may seem, we have eternity in Heaven to look forward to. This is such a great book, and if I win, I’ll be paying it forward to someone else who will get to enjoy it. I am so very thankful this year for the friends that the Lord has brought into my life. Not only for their friendship but for the way each one challenges me and changes me a little bit to be a better form of me. I posted to Facebook and I’m thankful for friends like you that truly understand my heart. I’m thankful for my washer and dryer that are have beein “working” all day for. I’m thankful for my oven and crockpot which are both emitting wonderful smells right now! On a more serious, sentimental note, I am thanful for my God, my husband, my kids, my parents, my sister, and my in-laws! I tried to share it on Twitter…my username is MomofWandL. I’m not very good at Twitter! I copy/pasted the link to your post. it doesn’t look right, but if you click on it, it pulls up your post! teach me how to twitter! ha! This book sounds amazing!!! I am so thankful for Christ and his gift of life to us! I shared on FB. Family and friends would have to be my second thing I’m most thankful for. They are all gifts from the Lord! I am first thankful for the saving grace and gift God gave over 2000 years ago. Also for His unconditional love and that He is with us always. I shared on FB. I am thankful for the awesome family and friends that God has put in my life. I shared on FB and I am so incredibly thankful for my loving husband and the provision he gives us. I am so eternally thankful for my loving, beautiful family. My two daughters have blessed me in more ways than I could ever begin to list and my husband has made my life complete. More importantly, I am thankful for God who has given me these blessings and many, many, more. I am thankful for the hard choices and sacrifices people made many years ago to come to the “New World” to have the freedom to worship God freely. I am thankful for the hard choices and even sacrifices God still calls us to make today. I am grateful for Jesus, my Redeemer, for a loving husband and 3 wonderful daughters. I am also grateful for family near and far. I shared on facebook and twitter. I’m thankful for Jesus, my wife, family, friends, and turkey.